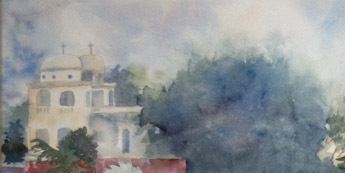 Since I love color and texture in my watercolor paintings, I often forget about aerial or atmospheric perspective. I'm working on a painting where the city and water reflections will be bold in color; the water is intended to contain the focal point. I fear that using my normal very bold colors throughout the painting will end up causing the painting to lose focus, so I spent some time looking at work by Joseph Zbukvic and Thomas W. Schaller. They are experts at soft muted paintings. I felt following their example might keep me from losing aerial perspective in this painting. I remember, when I first took watercolor classes, being told my paintings needed more aerial perspective. My struggle with this has continued for years in many of my landscapes. I get so wrapped up and excited by the color that - before I know it- things that are supposed to be in the distance have too much color to appear distant. To help me control this tendency I printed segments of Zbukvic's paintings. I will keep these printouts by my side as I paint and hope they will remind me of my goal. The picture in this blog is a small segment of the painting of the furthest back building and hills. I think I'm heading in the right direction. Many people just add blues in the distant areas. I wanted more variety in my painting so in addition to using more blues in the hills I added lavender and just a hint of a golden glow. In fact I put down the golden glow first so some brightness still showed through the haze. Lots of water provided the look of fog. At this point it looks very dreamy as if fairies could fly out of the trees and dance across the sky. I hope I can maintain this appearance as the painting progresses. I'll post updates as the painting develops. Often I don't like synthetic brushes because they don't hold enough water, but these Barroco brushes were very thirsty, holding a lot of pigment. I love the round, using it instead of a Kolinsky round I have used for years. The point is great, the tip springy, and the volume of pigment it holds is fantastic. I recently finished a painting of a village in Flores, Guatemala and found the flat was great for working on the buildings. Again it held a lot of pigment allowing me to pull the colors throughout the painting and the square edge stayed firm giving me crisp edges where I needed them. I augmented these 2 brushes with a 3/4" Kolinsky flat that I have loved for years. I can use it to quickly brush the surface when I want to remove a little water without moving around the color. It was the only other brush I have used in the paintings I've done since the Escoda brushes arrived. By the way, neither will be used for lifting paint, these brushes are too wonderful for that. Nick - Thanks for the great brush collection. I suspect Series 1 can't be too far off in my future. Also see Konstantin Sterkhov's interview of Nick which includes his thoughts on Escoda brushes. A friend and I were talking the other day about how I manage to paint regularly. She asked about my painting schedule. I told her I generally try to paint first thing after breakfast and work until lunch. I take off a couple hours to eat, check email, and often do a little art business. If I don't have other errands to run then I paint more in the afternoon. I stop no later than 6 pm since I prefer to paint when there is natural light. When I find the number of painting hours start to shrink I try to remind myself what Chen-Khee Chee suggested when I took a workshop from him some years ago; he said he starts painting each day at 8am and puts in a full day. I’m not sure how he is able to prioritize his art over everything else, but I admire that he can and know I am a much happier person when I can paint a full day. After I gave this answer my friend asked, but when do you exercise, clean, shop? I told her I try to restrict chores to weekends; I find exercise to be the hard part. Ideally, I go for a walk during my lunch time break. Sometimes I do stretching and some core strengthening exercises first thing after I getup. Sometimes I do arm exercises with weights after I stop painting for the day and before dinner. Unfortunately, I am not very consistent about any of these and, as a result, don’t really get enough exercise. In fact I wear an arm band by Body Media that monitors my activity each day. I can compare the calories I burn with the calories I consume in an attempt to balance and maintain my weight. The answer is not what I’d like most weeks. I started wondering what others do to manage life and painting. I hope you will share your ideas. When I paint portraits my goal is to capture the subjects doing something they love. In this case interacting with animals. 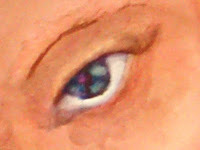 Often I find the subjects' eyes are crucial to expressing their emotions. The inset above is a closeup of his eye in "Pigeons In His Genes". His love of animals is communicated through that expression. 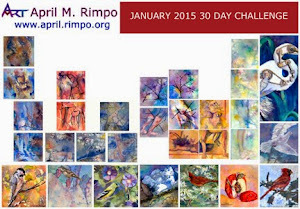 Visit my website at http://amrart.org/wcFigure.html to view other figurative paintings.